Where does the water come from? - - Where does the water come from? 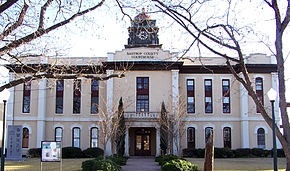 The Board will meet on Wednesday January 17, 2018, at 7:00 p.m. at Bastrop City Hall, 1311 Church Street, Bastrop,TX. We request that you attend and/or write to the District urging it NOT TO APPEAL the trial court ruling upholding private property rights. Judge Campbell’s order ruled that the District erred in denying party status to four landowners and REVERSED the District’s decision. Campbell also REVERSED the permit to pump 46,000 acre feet of groundwater per year that was given by the District to Recharge Water, L.P. and REMANDED the case back to the Lost Pines District for proceedings consistent with the Court’s decision. Environmental Stewardship, the other Landowners, and several elected official are urging the District to likewise reverse course and accept the court’s ruling that will allow the Landowners to protect their property and water rights. The Judge’s ruling affirms our position that whether you have a well or not is irrelevant — if your groundwater resources are going to be impacted by a pumping permit, then you, as a landowner, have the right to be heard. Please enter your e-mail address to receive email Newsletters, Bulletins and Action Alerts.